Yesterday, Apple revealed a whole slew of information about its Apple Watch line-up. No doubt many anime fans have been wondering the same thing: How does the Apple Watch compare to the Yokai Watch? Good question! Let's find out. Yokai Watch is a video game anime that took over Japan last year. 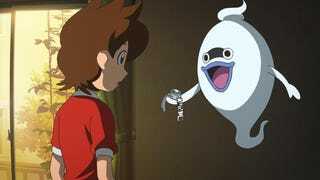 In Yokai Watch, the main character, Keita, has a watch that allows him to see yokai, which are a type of Japanese monster. The Yokai Watch was last year's hot—and very hard to get—toy. The Yokai Watch toy doesn't actually tell time. It makes noises and has a light you can point at something. But that's okay that it doesn't tell time. That's what smartphones are for, right? Twitter user Soo_mei compared the US$30 Yokai Watch with the Apple Watch that starts at a few hundred bucks and gets way more pricey. This is a serious comparison that needed to be done. Yep. Further evidence that I don't need an Apple Watch.